The video footage is surreal, a pair of gloved spacesuit hands wielding what looks like a silver dagger, poised to stab the outside of a Russian spacecraft. It was all part of an attempt Tuesday to solve the mystery of the leaking International Space Station. The leak was discovered in August, when cabin pressure in the ISS subtly dropped. Upon investigating, the flight crew found a tiny hole in the Soyuz capsule, which was docked to the space station. The crew slowed the leak with a piece of Kapton silicon tape, and later patched the hole with gauze and epoxy. But the question remained: What caused the hole in the first place? Investigators quickly dismissed theories of meteorite impacts, as the hole seemed to come from inside the capsule, said Dmitry Rogozin, the head of Russia’s space agency Roscosmos, according to state news agency TASS. And so on Tuesday the 2-millimeter hole led to a foot-long gash, as Kononenko sawed through the debris shield and insulation, looking for clues. As he vigorously cut into the spacecraft, small bits of insulation floated off into space. “In what is perhaps another first for the Russian space program, a cosmonaut has just unsheathed a large knife and stabbed his spacecraft,” wrote Moscow-based space journalist Matthew Bodner on Twitter. 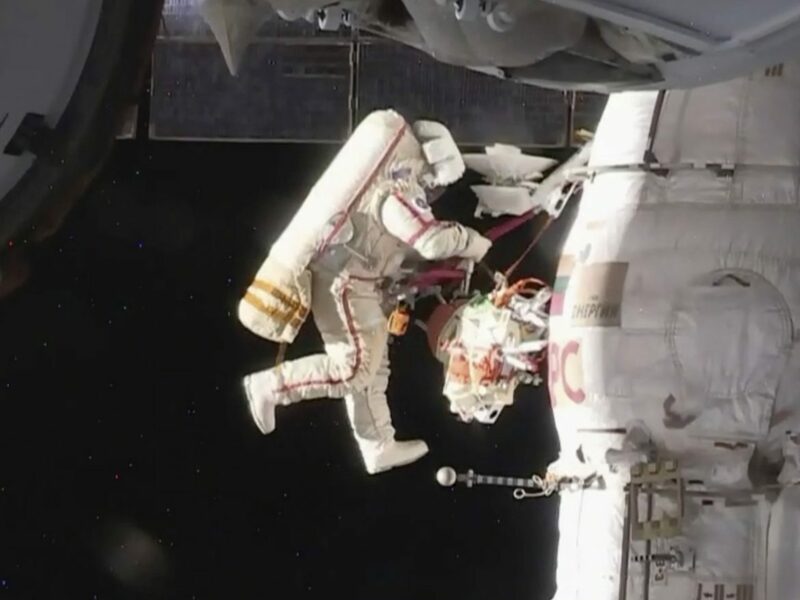 Eventually, the cosmonauts found the location of the sealed hole, and took samples of the epoxy, which will be brought to Earth for analysis, according to Space.com.